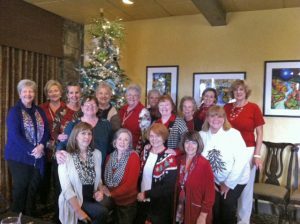 The Xi Gamma Kappa sisters held their annual Christmas luncheon at the Fairfield Bay Country Club on December 2nd. Shirley White and Mert Heimann hosted the luncheon with beautiful decorations and gifts for all. Secret sisters were revealed during the Christmas gift exchange. New 2017 secret sister names were drawn during the festivities. On December 14, Shirley Rudolph hosted an evening Christmas party for the sisters and their spouses at her home. Mary Ratcliff was the co-hostess. This was a fun filled party, enjoyed by all.